There are a few strings in the latest Zeus bot that are stored in an encrypted format. When a function needs one of them, it calls another function to decrypt the string and store it in a buffer on the stack. There are only about 50 of these encrypted strings, and as I found out, they aren't very interesting. They aren't exposing any hidden functionality - I suspect they were just included to make reversing the bot a little bit harder. It's very simple - each encrypted character gets the string length subtracted from it, then XOR'd with an 8-bit key which is different for each string. 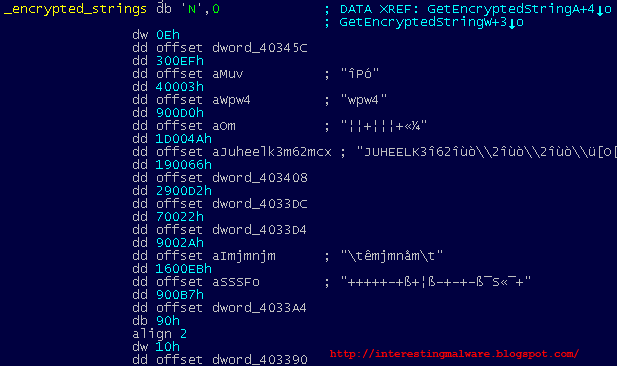 To make it easier to understand the disassembly, I wrote an IDC script that will first decrypt and label the strings in the encrypted string table, then search the code for references to the GetEncryptedStringA() and GetEncryptedStringW() functions to add comments to those. This makes reading and annotating the disassembly a little easier.